IT IS A GAME CHANGER! Our service excellence management system is based on four main areas, excellent strategy and leadership, excellent employees and culture, excellent customer experience and excellent processes, systems and structures. We know the delight factors and success factors for service excellence. Our Service Excellence management concept is for companies of any size. 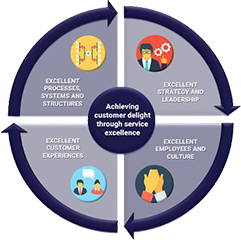 It is a systematic approach which will help you embed service excellence in your company`s culture and achieve customer delight moments. We are the experts! Forward-thinking companies have recognize that customer demands are constantly growing. It is not enough anymore to satisfy your customers by fulfilling their requirements to a certain degree. You have to delight them by exceeding their expectations to surprising degree. Delighted customers create substantially more revenues and repeated sales with an increased loyalty of more than 50%. You want to implement the service excellence management concept? Is your organization ready? We will help you to find out. We will look into internal and external factors impacting the customer experience you create, we look at customer touchpoints along the customer journey influencing your customers behavior. With this results we can plan the implementation of the Service Excellence management concept. 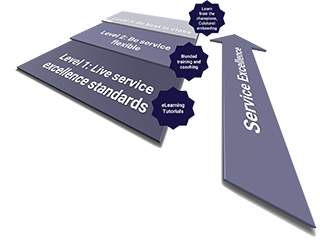 Our Service Excellence Academy is an online academy for service excellence management, coaching and consulting helping companies to create a perfect customer experience and to delight their customers. In service, employees play an essential role in satisfying and delighting customers. We offer easy-to-use eLearning tutorials, training your employees efficiently and effectively. Excite, motivate and empower your teams to deliver outstanding service and implement a systematic approach to customer delight. Our academy offers eLearning you and your employees control. Our training is stimulating and easy to use, it motivates and engages adult learners and creates a meaningful educational experience. For larger enterprises, we can also offer white label solutions for use with your own Learning Management System. 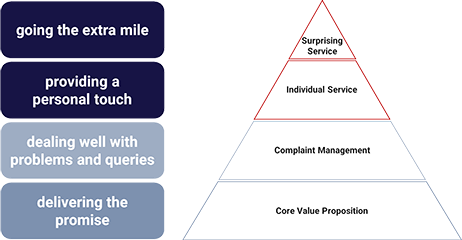 oneservice supports companies in implementing and embedding our innovative service excellence management concept. We look at all dimensions, internal and external, and comes up with detailed actions and implementation strategies for service excellence. This includes customer- and employee delight and actively supporting companies with the implementation of these objectives. We create customer experiences and customer delight base on the Service Excellence Management Concept. Blended learning is a method that has proven to be not only effective in terms of learning outcomes, but also ranks highly on ratings of satisfaction with students and instructors. In combination with our eLearning we offer workshop-based blended learning sessions. This allows your organization to reduce the time that your employees spend in a face-to-face, traditional classroom format trainings. If you and your employees embrace flexibility combined with a high learning outcome, our approach will directly positively impact your day to day business success.